Just because you can’t see it, smell it or taste it doesn’t mean it won’t hurt you! Radon is a health hazard with a simple solution. 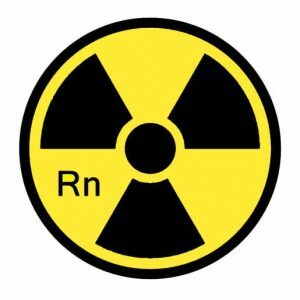 Radon is a naturally occurring radioactive gas that can cause lung cancer. You can’t see or smell radon. 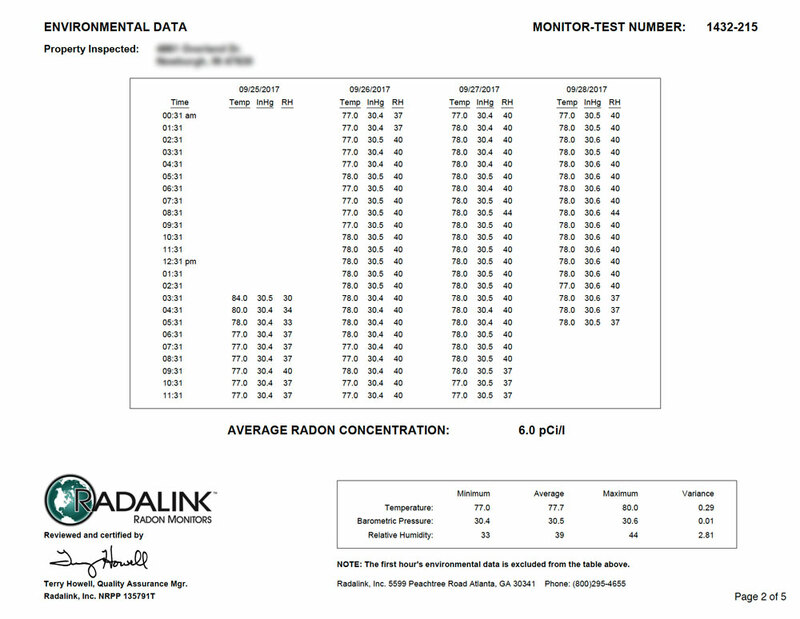 Testing is the only way to know your level of exposure, and the presence of radon can have a big impact on indoor air quality. Should I test my new home for Radon? Our professional radon gas testing services offer peace of mind to check the radon levels in your home or property. 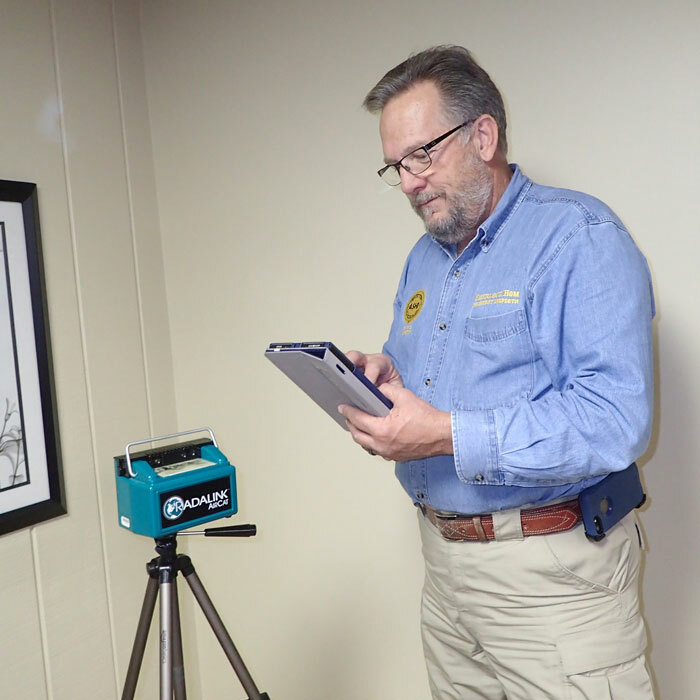 We urge you to consider a professional radon test as part of your inspections because of the potential safety and health risks associated with radon gas exposure in your home or building. 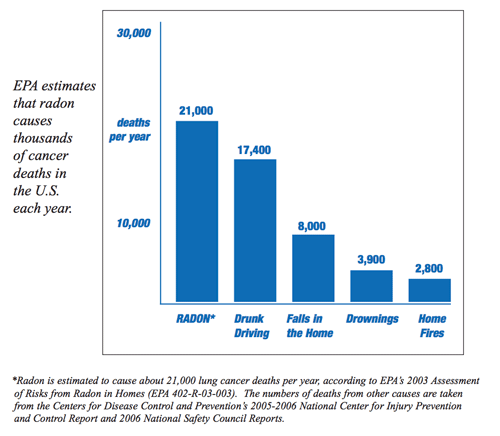 Radon exposure is the leading cause of lung cancer in non-smokers; radon causes lung cancer in smokers as well. There has been more epidemiological investigations exploring the association between radon (and its decay products) and lung cancer than any other environmental carcinogen. Experimental exposure in animals, occupational studies of radon-exposed miners, and direct observation from individuals exposed to radon in their homes provides a firm scientific foundation that documents radon is a major environmental carcinogen. The U.S. Environmental Protection Agency (EPA) and the Science Advisory Board increased their radon risk assessment by more than 50% and now estimate 21,000 Americans die of radon-induced lung cancer annually. Because radon is a Class A carcinogen, the U.S. Environmental Protection Agency(EPA) and the Surgeon General recommend ALL HOME OWNERS and ALL HOME BUYERS test for indoor radon. Homes with elevated radon concentration can easily be fixed with the installation of an Active Soil Depressurization System by a certified and state licensed radon mitigation contractor. ASD systems also decrease moisture and other soil gases entering the home, reducing molds, mildews, methane, pesticide gases, volatile organic compounds and other indoor air quality problems. Can I have elevated radon if I don’t have a basement? Absolutely. We have tested hundreds of homes without a basement that had elevated radon levels. Isn’t radon only in older homes? My home is new. Radon levels have nothing to do with the age of the structure. The biggest factor determining the radon level in a home is what is in the soil next to the foundation. I’m thinking of buying a home with a radon mitigation system. How do I know if it is working? Ask the seller for a copy of the independent post mitigation measurement that should have been conducted following mitigation. Retest the home, especially if it has been more than two years since it has been tested. 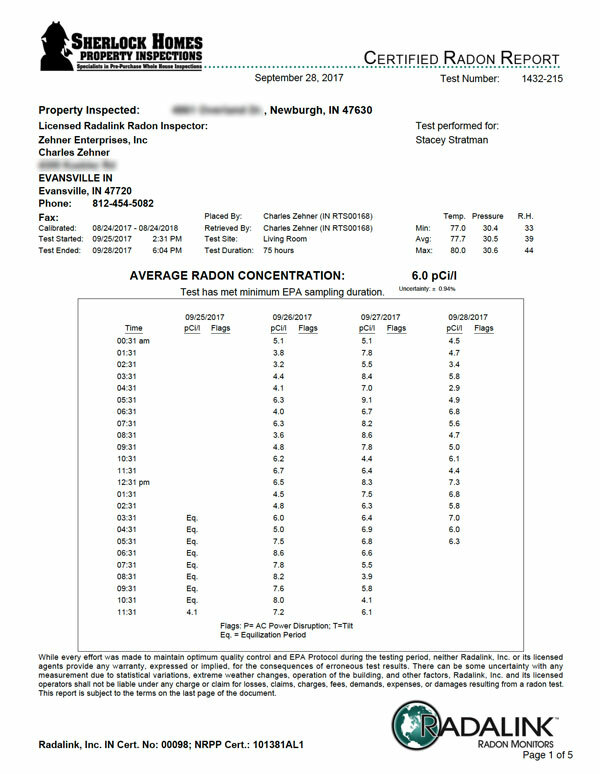 Have your mitigation system inspected to confirm that it was installed per EPA protocol. Can’t I test my home myself? Yes, there are inexpensive home test kits available. Follow the instructions carefully. However, many people choose to have their new home professionally tested because they want the seller to incur the cost to install a mitigation system if there is an elevated level. Radon testing is a simple and painless process. For a real estate transaction, we’ll test in the lowest livable level of the home. The lowest livable level of the home may be a basement or the first floor. A short term radon test must run for at least 48 hours. The test’s average is used to evaluate the need for mitigation. 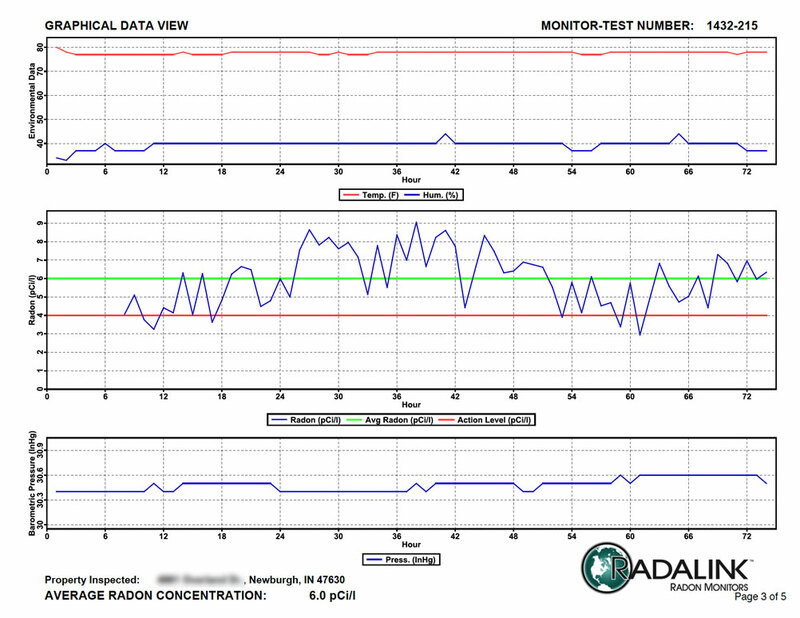 The Radalink AirCat monitor will collect data on the radon level for each hour of the test. It will also record control data to help ensure that the necessary conditions were maintained during the testing period. After the test period is completed, we upload the data to the lab and the report is sent out shortly. Results are usually available within an hour after testing. Should you or your buyer choose to have us test for radon, your Sherlock Homes Inspector will set up, start, and begin radon testing. The radon test runs for a minimum of 48 hours. 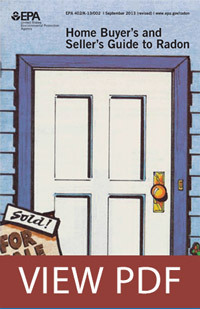 During the test, all doors and windows to the house must remain closed, except for normal exit and entry. Once the test is complete, we will return to retrieve the equipment and upload the data. Many home buyers will want to test for Radon levels as part of their home inspection contingency. Open windows and doors can result in false high or low readings. 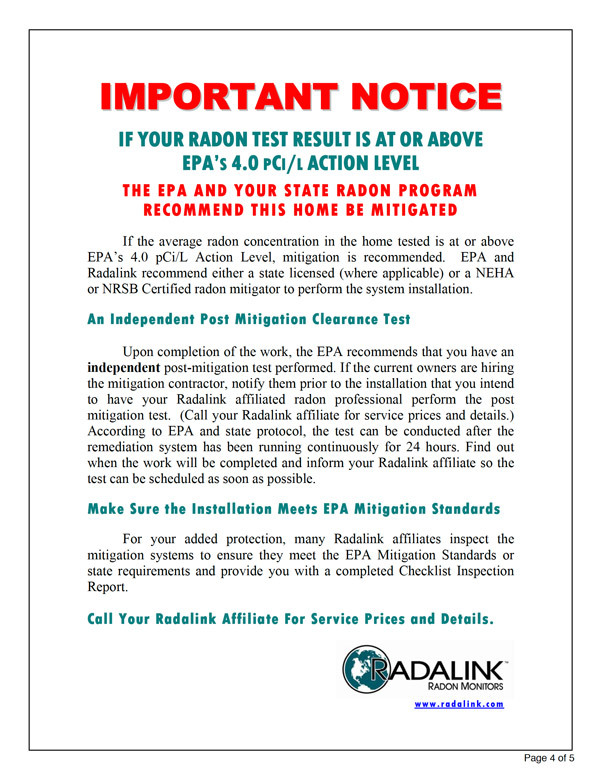 Schedule your Radon Test Today!